Mobile gaming has come a long ways over the past few years. From console-quality graphics to extremely addictive arcade-style fun that’s easy to play and waste a few minutes. There are tons of addictive Android and iOS games available, and everyone likes something different. 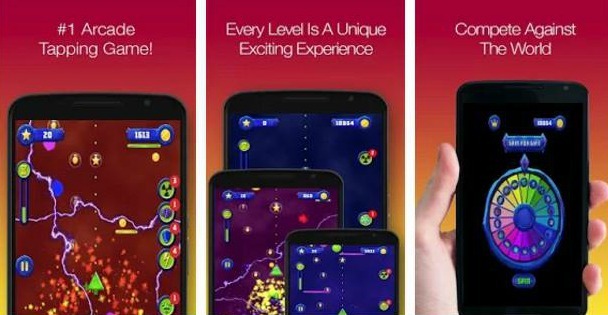 The most addictive smartphone games are the ones you can pick up and play in seconds and are easy to play, yet hard to get a high score. Or those that take hours and hours to try and complete. One of those games is Tap and Smash – a cross-platform game that offers a full tap jump experience. This tapping arcade game is designed with fantastic graphics, engaging music and sound effects and has very addictive and challenging gameplay that will glue your hands to your device. You are playing and controlling a triangle, by tapping on your device’s screen. Your main goal is to take him up in order to make higher scores. There are multiple obstacles that will try to interfere with your way and make you lose the game, so avoid them and keep going up. You have to to catch the stars, get a boost and collect as many coins as you can. Also, you will have the chance to exchange them for various helpful power ups. You can also enter the game’s store and get even more powerful items. Immerse yourself in a wonderful gaming experience by downloading Tap and Smash for free from Google Play or from the App Store and share it with your friends!